Installation of a 2,100 lf low permeability (grouted joints) steel sheet pile wall to serve as the south wall for a planned confined disposal facility (CDF) to house dredged sediments. Installation of 2,100 lf conventional steel sheet pile wall to serve as an anchor wall. Installation of 150 psi tieback rods to stabilize both steel sheet pile walls. Construction of a concrete cap and parapet wall on top of steel sheeting. Developed of all required project work plans including the Environmental Protection Plan, Accident Prevention Plan, Health and Safety Plan, and Construction Quality Control Plan. Implemented a detailed quality control plan. All schedule updates, plans and submittals were tracked through the US Army Corps of Engineer’s QCS/RMS system. Received an “Outstanding” performance evaluation from the Chicago District, US Army Corps of Engineers. The Indiana Harbor and Ship Canal (IHSC) is an artificial waterway on the southwest shore of Lake Michigan, in East Chicago, Indiana. The IHSC connects the Grand Calumet River to Lake Michigan. It consists of two branch canals, the 1.25 mile Lake George Branch and the 2 mile long Grand Calumet River Branch which join to form the main Indiana Harbor Canal. The Indiana Harbor Canal also functions as a harbor and runs 1.4 miles before reaching the Indiana Harbor which connects to Lake Michigan. An estimate 150,000 CY of sediment from IHSC enters Lake Michigan every year. There has been a long history of industrial activities within the river basin. The land located north of the river is one of the most heavily industrialized areas in the United States. Some of the industries that operate, or have operated, in the area include steel mills, foundries, chemical plants, and oil refineries. Permitted discharges from industrial operations, municipal wastewater treatment plants and other sources contribute substantial quantities of wastewater to the river system. Nonpoint sources of contaminants to the system include urban and industrial runoff; combined sewer overflows; leachate or overflow from a number of waste fills or ponds; and spills in and around industrial operations. Releases of waste and wastewaters from these sources have resulted in the contamination of surface water, groundwater, sediment, and biota with a variety of toxic substances. Concerns associated with the widespread contamination of surface waters and sediments led the International Joint Commission to designate the Indiana Harbor complex as an Area of Concern under the Great Lakes Water Quality Agreement. The US Army Corps of Engineers plans to dredge sediments from the IHSC to allow its continued use as a navigable waterway. 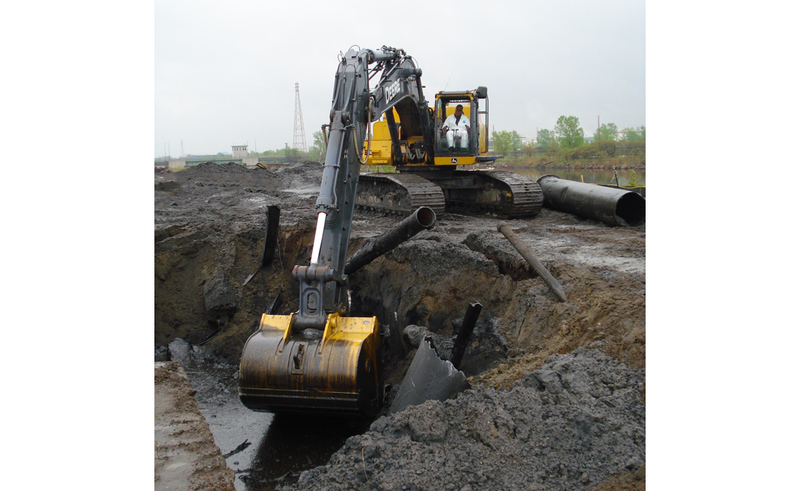 The Corps will place dredged sediments into a confined disposal facility (CDF). It is expected that the CDF will hold 4.67 million cubic yards of sediment. Sevenson was awarded a competitively bid contract to construct the south steel sheet pile cut off wall of the CDF. 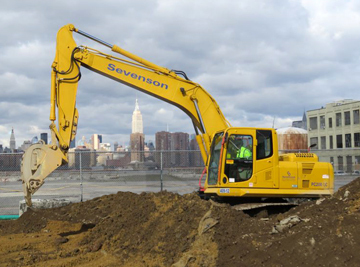 Sevenson utilized the US Army Corps of Engineer’s QCS/RMS system to track and document construction activities. All plans, submittals, and daily quality control reports were tracked through the QCS/RMS. Requests for information to address technical questions were also tracked through the system. Sevenson developed a project schedule utilizing Primavera P3. The schedule was updated on an ongoing basis and exported from P3 into QCS/RMS to facilitate progress payments. Prior to mobilization, Sevenson developed all required preconstruction plans for the project, including an Environmental Protection Plan, Accident Prevention Plan, Health and Safety Plan, and Contractor Quality Control Plan. Additional plans were developed as the project progressed. Site preparation activities included mobilization, establishment of project infrastructure, staging areas, construction of an oil/water separator, and abandonment of 51 monitoring wells. The site was also laid out for day-to-day operations. Investigative trenching was performed to locate and remove any underground obstructions along the anchor wall alignment prior to initiating sheet piling operations. 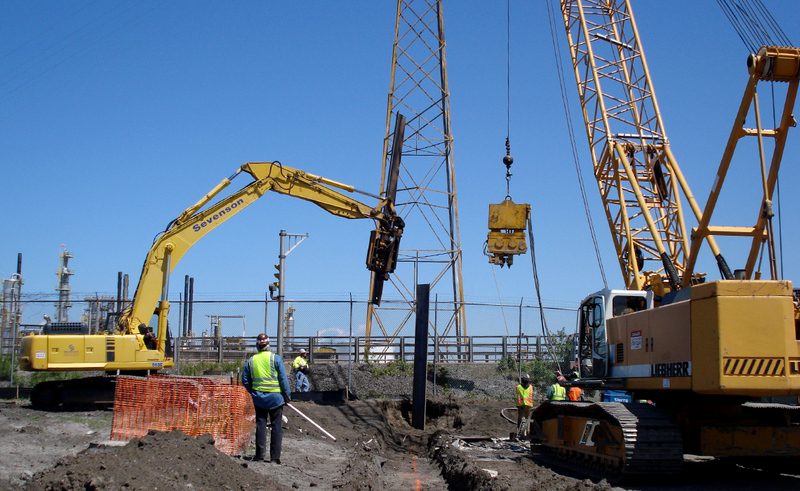 A 2,100 lf sheet pile anchor wall was installed using a vibratory sheet pile hammer attached to a 100-ton crane. The anchor wall consisted of 48,000 SF of AZ17-700 sheet pile. 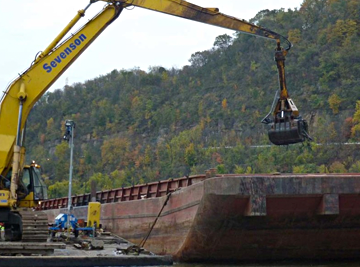 Upon completion of the anchor wall, Sevenson installed the 2,100 lf main sheet pile wall, using a vibratory hammer. The main wall consisted of 137,000 SF of AZ46 sheet pile, with a specified interlock sealant. In addition, two tieback walls at the east and west end of the main wall were installed. The tieback walls tied into an existing bentonite cutoff wall. 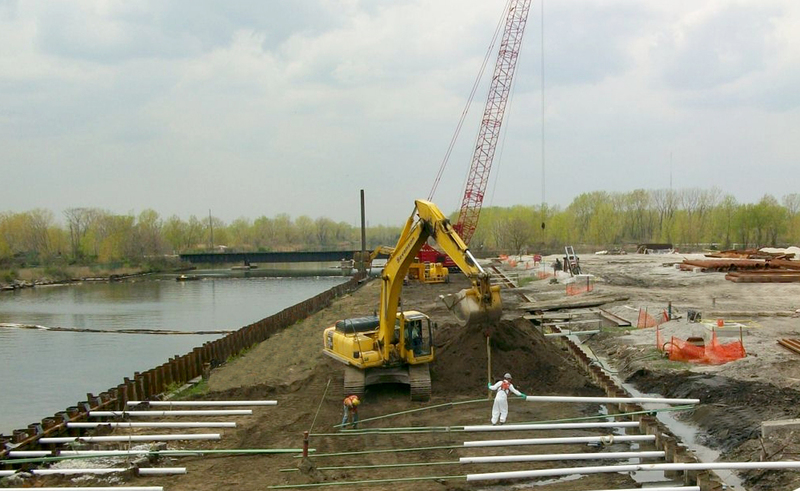 The main wall and anchor wall were anchored utilizing 150 psi tieback rods secured to walers installed at the top of the sheet pile walls. 8,800 CY of stone backfill was placed between the newly installed main wall and an existing sheet pile wall. 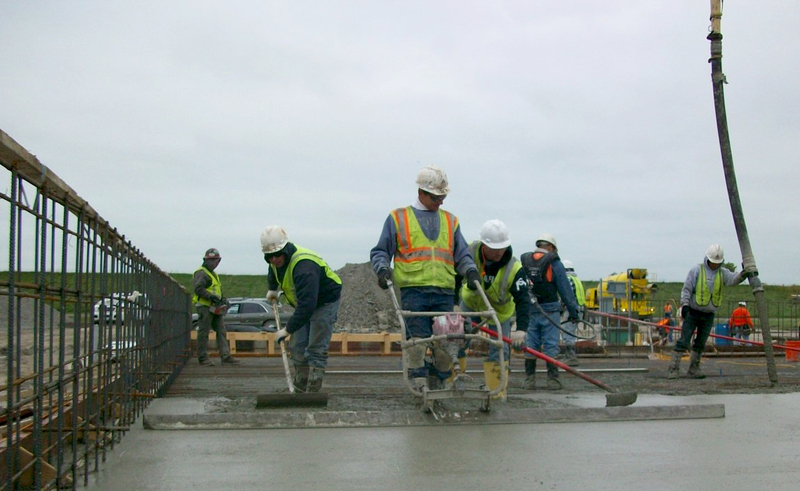 A concrete cap and parapet wall was constructed on top of the finished sheet pile wall system. 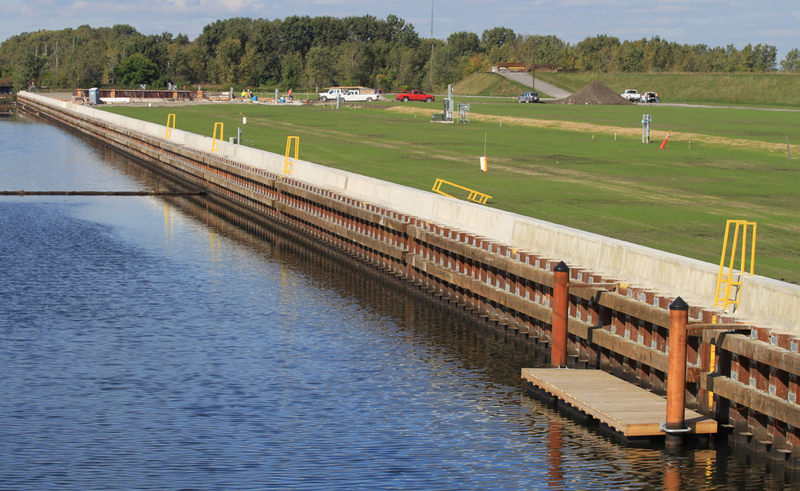 The concrete parapet system acted as a physical barrier for the sheet pile wall system and provides a long-term curb for future canal dredging operations. 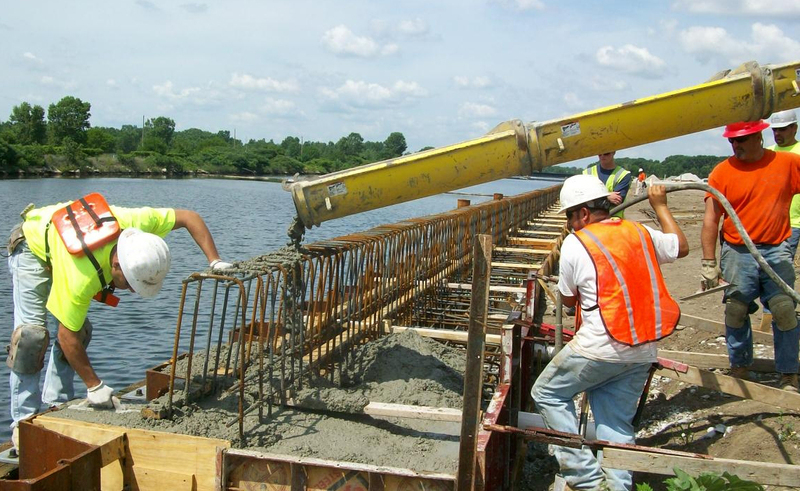 A reinforced concrete crane pad was also constructed for future canal dredging operations, along with 20 ft wide road entryway that tied into the existing site access road. 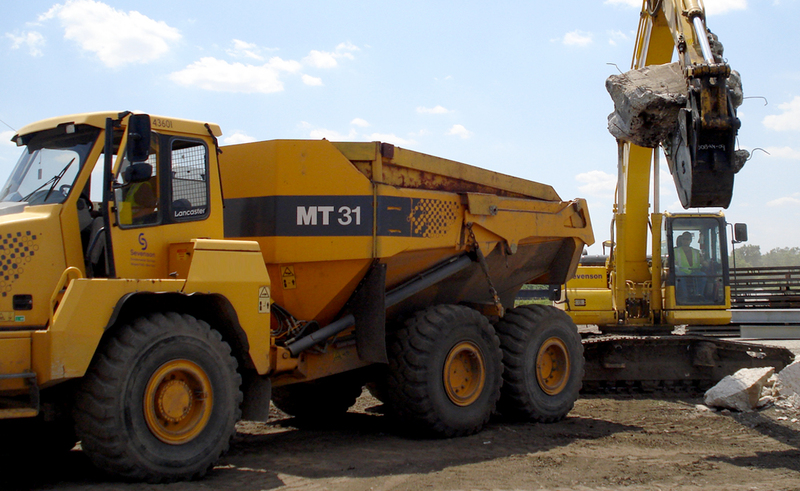 Upon completion of concrete work, all disturbed work areas were covered with approximately 900 CY of low permeability clay material, topsoil, seed and mulch. During installation of the grouted steel sheet piling cutoff wall it was learned that the specified sealant system could not meet the required permeability. When site groundwater came into contact with the sealants, the sealant system failed. After lengthy discussions with the Corps and detailed laboratory and field testing Sevenson recommended switching low permeability steel sheeting systems to its proprietary Seal Wall Systems as an alternative to the system originally specified. A field demonstration of Sevenson’s Seal Wall System was conducted. It successfully met the contract performance criteria. The next challenge became Sevenson’s ability to locate a facility in close proximity to the job site where a fabrication shop could be set up with the capability to fabricate and deliver the system back to the jobsite in rapid fashion to maintain the project schedule. Sevenson located a facility within 5 miles of the site and performed all the fabrication work with its own forces. 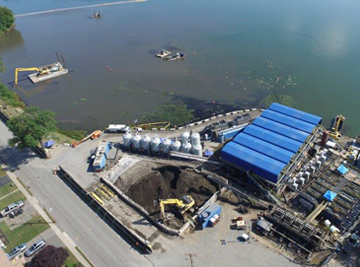 Without Sevenson initiating and installing an alternate low permeable sheet piling and grouting system, the project would have been indefinitely delayed. This would have restricted in severe delay in the next phase of the project which is the dredging of the Indiana Harbor and Ship Canal. Sevenson received an overall rating of “Outstanding” in the post-construction Performance Evaluation by USACE. The Site Safety and Health Officer (SSHO) implemented the SHERP. And conducted safety audits. All site workers were 40-hour OSHA and HAZWOPER certified.